Professor Emeritus John Brown Childs and City Council Candidate Drew Glover. 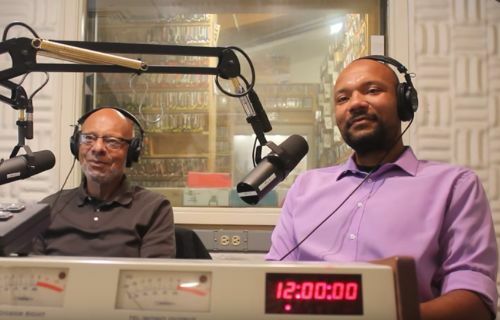 On June 13th 2018, dj discipline with 88.1 FM KZSC brought together John Brown Childs, Professor Emeritus of Sociology at UC Santa Cruz with Drew Glover, a Cabrillo College sociology student and Santa Cruz native to discuss cultivating a collective living. Brown Childs was an ally of the Student Nonviolence Coordinating Committee during the voting and civil rights movements in Montgomery, Alabama in 1965. Brown Childs continues to work locally and in Soledad Prison teaching a course introducing “transcommunality” - an idea and set of practices which he draws from the Haudenosaunee (Iroquois Confederacy) ways of thinking. This philosophy approaches communities as coalitions that account for differences in their very act of coming together (Childs 2003). Glover, an activist with the Santa Cruz Resources Center for Nonviolence is part of a new generation entering politics, and is a candidate for City Council. Childs, John Brown. Transcommunality: From the Politics of Conversion to the Ethics of Respect. Temple Univ Press, 2003.